American manned Mars expedition. Study 1984. The Case for Mars II Mars expedition plan was presented at a conference on 10-14 July 1984. This proposed the establishment of a permanent space infrastructure to ensure safe and economical exploration of Mars. It pulled together all of the elements proposed by Mars enthusiasts to minimize spacecraft mass and eliminate expendable hardware: aerobraking, a flyby-rendezvous mission scenario, Mars Cyclers, and in-situ resource utilization (ISRU) to produce propellants on the Martian surface. The mission scenario developed at the Case for Mars II workshop was intended to demonstrate that human missions were possible using then-current technology. The mission concept incorporated a flyby cycler spacecraft and the use of aerocapture to minimize fuel requirements. A crew of fifteen would rendezvous on the surface of Mars with supplies and equipment sent ahead. Water, air, and fuel would be manufactured from the Martian atmosphere, and farming would be used to grow food for the crew. This would establish a base for later expansion, as well as a self-sufficient safe haven on Mars not dependent on the success of interplanetary flight schedules. As part of a larger space infrastructure, it was proposed that two space stations be placed in cyclical orbits. These would allow departures for a six-month journey to Mars every 20 to 30 months. Passengers bound for Mars would rocket from earth orbit aboard a small Crew Shuttle Vehicle to rendezvous and dock with a passing Cycler in deep space. On approach to Mars, they would enter their Crew Shuttle Vehicle, undock, and use aerobraking to enter Mars orbit and land on the planet. Prepositioned on the surface would be a surface habitat, surface exploration equipment and vehicles, and ISRU equipment that would process the thin Martian atmosphere to produce the 145 metric tons of carbon monoxide/liquid oxygen propellants required by the Crew Shuttle Vehicle for the return trip. After one to two years of surface exploration, the crew would board the Crew Shuttle Vehicle, and rocket out of Mars orbit to intercept a passing Cycler for a 20 to 30 month return trip. On approach to earth the astronauts would enter the Crew Shuttle Vehicle, separate from the Cycler, and re-enter the earth's atmosphere. A new crew would be launched every two years to ensure continuous occupation of a base on the Mars surface. The first expedition would launch in 2007 and return in 2012; the second departure would be in 2009 and return in 2014. It was assumed additional Cyclers would supplement the infrastructure, and continuous occupation and expansion of the Mars base would continue thereafter. Crew Shuttle Vehicles were two-stage biconic vehicles shaped like nuclear warheads, designed for aerobraking at Earth and Mars. 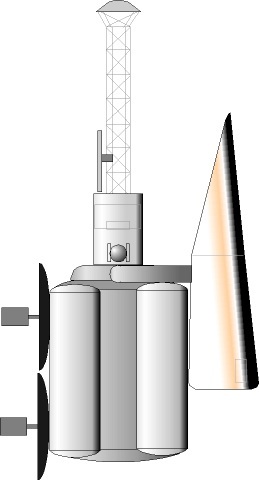 A heavy-lift launch vehicle, based on shuttle hardware, with a 68 metric ton payload, would be used to assemble the spacecraft in earth orbit. Despite all of the weight-saving measures, it would still require 24 HLV and 20 shuttle launches to assemble the various payloads for the first two expeditions in earth orbit. Two kinds of Mars Spacecraft, Cargo Landers and Interplanetary Spacecraft, would be assembled at an American Space Station in low earth orbit. Hardware components would be delivered by the Space Shuttle and/or a Heavy Lift Launch Vehicle. The Mars hardware would be derived from available Shuttle and Space Station systems. The warhead-shaped Mars landing vehicle would be the only entirely new development. Propellant would be delivered directly as residuals in the External Tank of the Space Shuttle or a shuttle-derived Heavy Lift Vehicle. Propulsion for trans-Mars injection would be provided by two Space Shuttle main engines per spacecraft fueled by liquid hydrogen and liquid oxygen. After boost the spent fuel tanks and attached engines would be jettisoned. In preparation for the manned expedition, Cargo Landers would be launched toward Mars. Protected by aeroshells, they would brake into Mars orbit, and then descend to a parachute- and rocket-braked landing on the surface. After confirmation of safe arrival of the Cargo Landers, three identical Interplanetary Spacecraft, each with five astronauts aboard, would be boosted toward Mars. After the main rocket burn, two umbrella-like solar collectors would be deployed to run solar-thermal electric generators. A truss supported an aeroshell ahead of the Interplanetary Spacecraft would later be used in aerobraking on return to Earth. Three days out and just past the orbit of the Moon, the crews would maneuver thee three Interplanetary Spacecraft and dock them in a pinwheel configuration. The assembled structure would be spun at three revolutions per minute to produce 1/3 G artificial gravity. After a six to eight month voyage, the spinning cruise configuration would be approaching Mars. The crews would board the three landers, then depart the Interplanetary Spacecraft and fire the landers' engines to encounter the planet. Unoccupied, the Interplanetary Spacecraft would perform automated firing of its engines (based on the Space Shuttle Orbital Maneuvering System OMS engines) at Mars flyby to put it on an Earth return path. Back at Earth, it would brake into earth orbit, and be refitted to carry another crew outbound and pick up those ready for return. Meanwhile the landers would aerobrake into Mars orbit. The shapes of the landers would be derived from well-understood technology developed for ICBM reentry vehicles. After accurate determination of the location of the previously-landed cargo ships, the landers would make a precision entry into the Martian atmosphere and land at the cargo site, with final descent slowed by parachute and five rocket engines. Following landing, the base would be assembled. The cargo vehicles would be oriented nose to tail and connected together for use as the dwelling. Redundant nuclear power generators would be placed at a safe distance. ISRU equipment would be deployed to process Martian atmosphere into oxygen for the crew and propellant for the landers' ascent back into space. Inflatable greenhouses would be erected to supply food and provide a partially closed biological system. After over a year of surface exploration, the ISRU equipment would have generated enough fuel for the three landers. The next Interplanetary Spacecraft would arrive to deliver a replacement crew and bring the first crew home. In case of failure of the next outbound spacecraft, the crew would be safe on Mars, self-sufficient until the next return opportunity. The first crew would ascend from the surface in the three landers, heading toward a rendezvous with the Interplanetary Spacecraft in deep space as it flies by Mars. The next crew arrives a short time later, having departed from the same spacecraft as it approached Mars. Approaching Earth, the Interplanetary Spacecraft would fire its OMS engines and brake into a high elliptical orbit and divide again into three vehicles. The separate spacecraft would aerobrake over a period of weeks into a low earth orbit near a space station. The crew need not wait for this; they could use their Mars landers to aerobrake directly into low earth orbit. All of the elements were refurbished for use by the next crew to be sent to the permanent base. Summary: First consensus study to introduce ISRU for propellant production. Family: Mars Expeditions. Country: USA. Bibliography: 1989, 591.